Tramore racecourse is where the turf meets the surf and it is one of the most intimate stages for racing in Ireland. The 4-day mid-August festival (incorporating 3 evening meetings) has everything a summer racing festival should have: sun (usually), sea, sand, spectacular racing and anything else that takes your fancy on a hot summers day. It offers a great opportunity to take a racing holiday because of the great amenities on your doorstep in Tramore, one of the premier seaside resorts in Ireland. On their infamous Family Fun Afternoons, you won't have to work so hard to keep the children amused before or after the racing because they are catered for. During the Winter holiday season the first day of the 2-day New Year's Eve/Day meeting is a great place to start off those end of year festivities and the following day an even better place to finish them off in style. Waterford people in general are an enthusiastic racing crowd and this, coupled with a strong following from surrounding counties, ensures a good atmosphere at all the meetings. The racing is an even mix of flat and jump races. 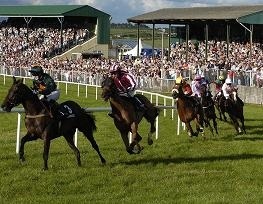 Check out Tramore Races Website for full details of dates and prices.